Decorating a baby room can be a fraught process, especially for first-time moms. Mainly, it's a decor project that tends to be a place where all one's anxieties gets channeled. If you're currently creating one too many Pinterest boards dedicated to baby room color schemes, we're here to help. Instead of stressing over themes and motifs, take inspiration from these designer projects. 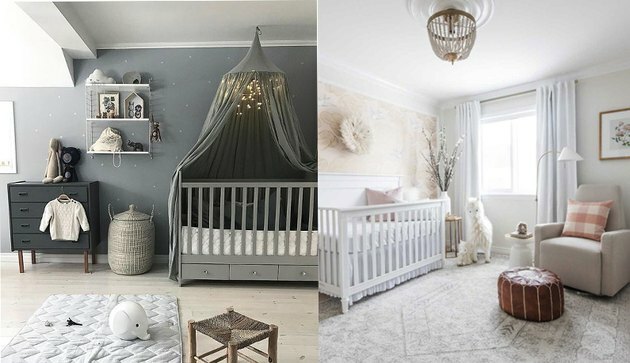 Any one of these rooms would make a stylish setting for your bundle of joy. Here's how to do "cute" without going too "cutesy." 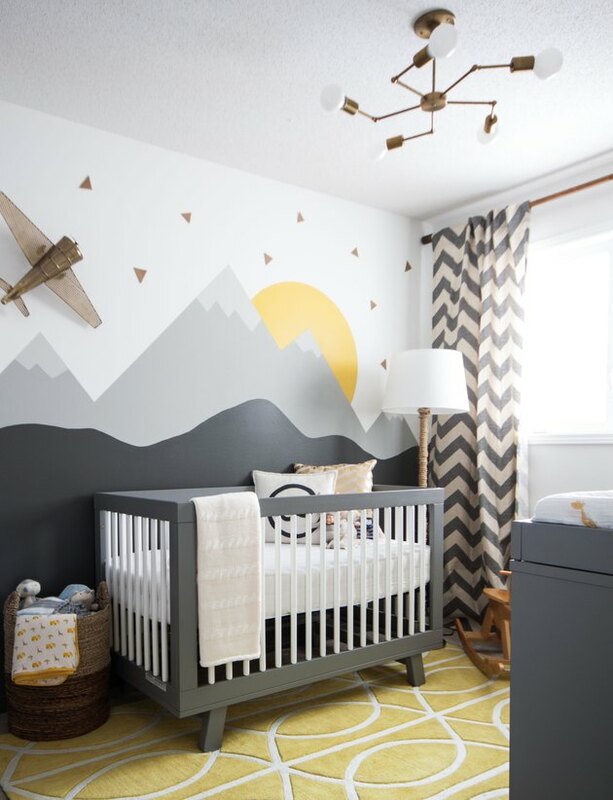 This modern baby room by Leclair Decor is all about the statement wall: A mountain scene that'll look just as stylish years later. The gray hues of the mountain landscape echo the crib, dresser, and curtains for a cohesive look. Don't want to go so bold? This other baby room design by Leclair Decor has a definite softer feel that comes from mixing pale blush tones with white and beige. Erin Kelly of A New Bloom completely renovated a bedroom in her 110-year-old home into a sunny and cheerful space for her two daughters. 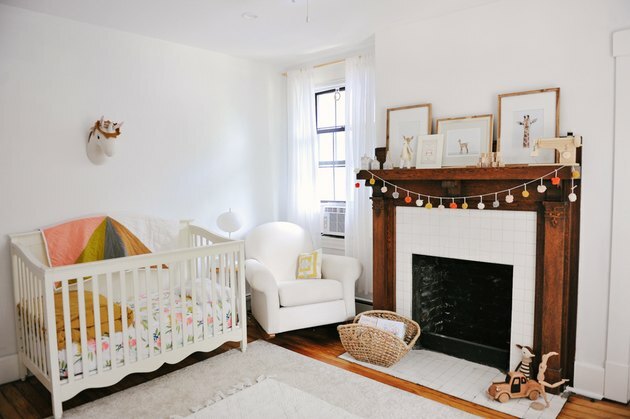 (This crib belongs to her older daughter Emerson, with new baby Marlowe moving into the space in a few months.) The simple white color scheme allows Erin to easily update the decor as the girls get older. 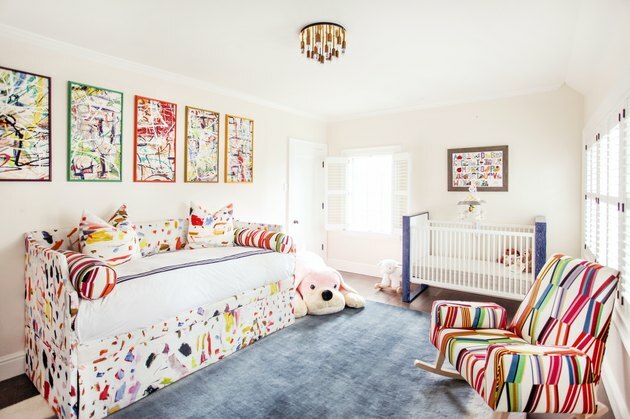 If a sibling is sharing a space with your little one, a multicolored scheme (like this fabulous design by Sasha Bikoff) keeps everyone happy — especially if your little ones are nuts for color and paint. The older kid can pick out bedding that they like in the colors they love, while the bright hues feel appropriate cheery for the baby. 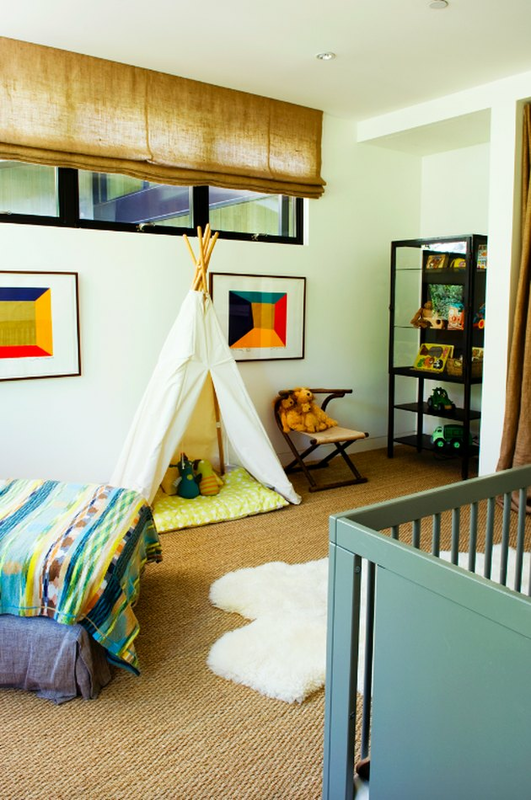 Shared sibling spaces can also include play zones, like in this kids/baby room by Vanessa Alexander of Alexander Design. A nook within the room keeps all the toys and fun stuff out of the pathway near the crib. It's a decor move you'll appreciate when you're navigating the room at 3 a.m. for an early morning feeding. 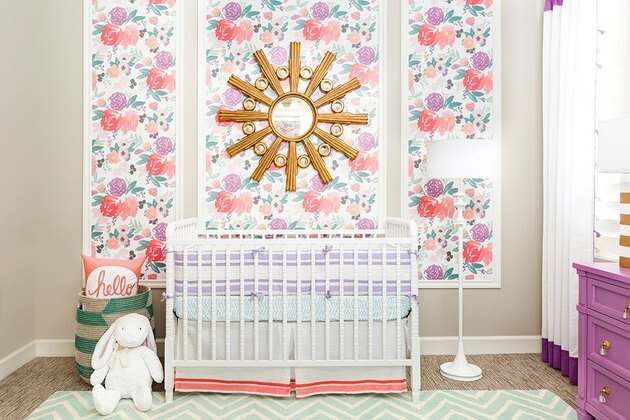 Panels of floral wallpaper add a dash of style in this nursery by J&J Design Group, which specializes in modern kids' rooms. The gold mirror is an inspired touch, adding a little bit of shine and a charming sun shape. 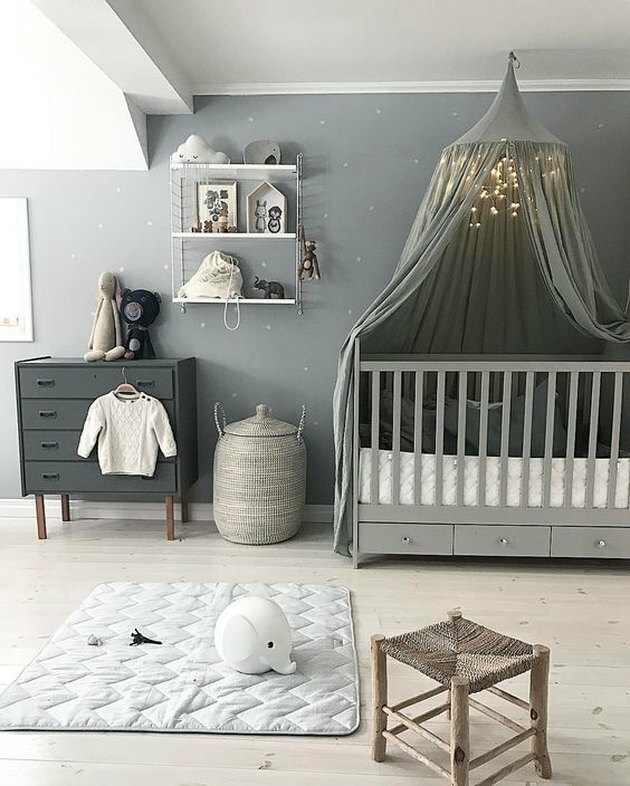 This monochromatic room feels modern at first, but the romantic canopy over the crib — complete with fairy lights — takes this room to a new level. Plus, that soft lighting will double as a night light! 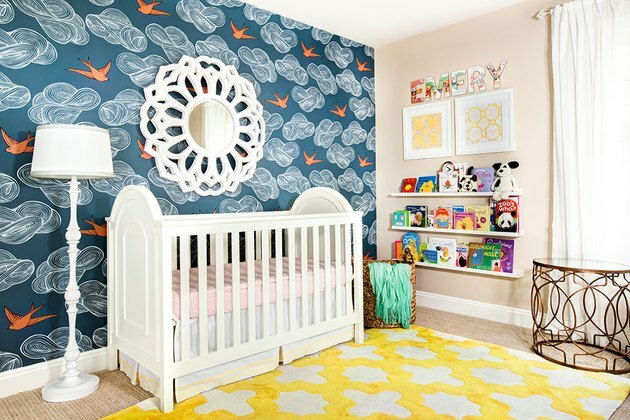 Here's another great use of a statement wall in another standout baby room by J&J Design Group. The allover print has a larger scale that feels a bit more like a mural than a traditional wallpaper print. 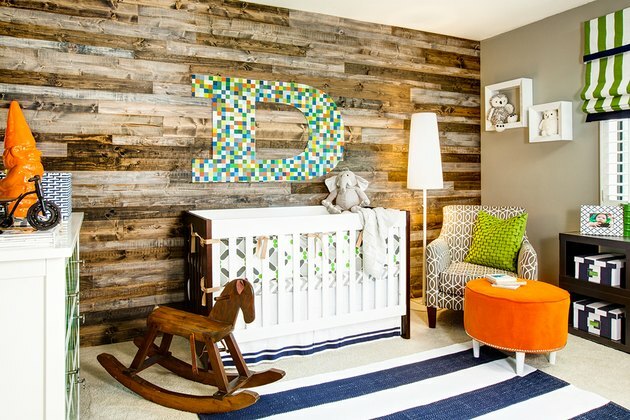 J&J Design Group uses texture to a striking effect in this rustic-modern baby room. Inspired by aged wood planks, the wall covering is versatile enough to work with any art or accessories. 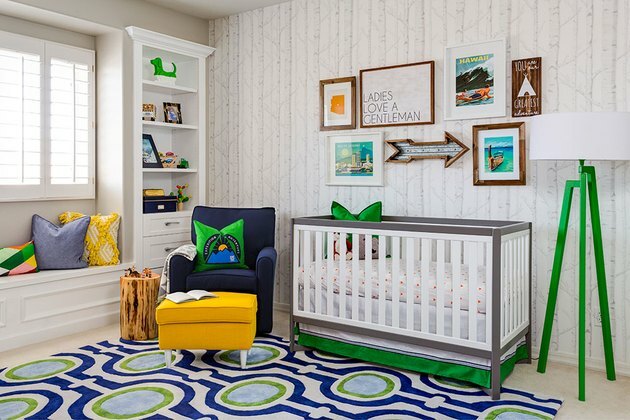 This baby room features a statement wall decorated with wallpaper, but what really stands out are the pops of green. Since the wall pattern is a bit quieter than the other motifs, the focus is shifted more to the room's art and accessories.